What is a DRP (Direct Repair Provider) shop? Most major insurance companies provide their customers with a list of DRP’s. The DRP must meet certain requirements set up by the insurance company. 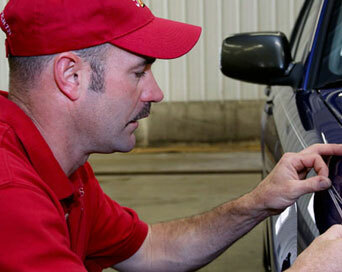 Scott’s Body Shop is a DRP for most major insurance companies in this area. Am I required to go to the facility that my insurance company recommends? No, we recommend that you go with a shop that you know and trust. (We hope that is us.) Your insurance company cannot require you to go to a particular repair facility. You have the right to choose your repair shop. No, at Scott’s Body Shop you do not need an appointment. Our Estimators are available during business hours Mon-Fri, 8:00 am to 5:00 pm. How long will the estimating process take? Most repair estimates take 10-20 minutes. The process may take longer if, for example, extensive damage exists or vehicle is an older model and parts are uncommon. What should I bring with me when I come in for an estimate? Please bring with you any documentation received from the insurance company involved. Some examples may be emails, prior written estimates, insurance claim numbers, insurance company contact names and phone numbers, and pre-issued insurance checks. Do I need 3 estimates? No, you are free to get as many estimates as you desire, but it is not necessary. You just need to choose the shop of your choice and notify the insurance company. I need a ride to/from home/work? We can provide you with a complimentary ride to or from our shop when dropping off or picking up your vehicle within the local area. Do you have a key drop? Yes, we have a key drop at the front of the building in the event you need to drop your vehicle off after hours. Arrangements can be made for picking up your vehicle after hours as well. Am I entitled to a rental vehicle? Your insurance company has the definite answer to this question. The general rule is, that if you have purchased rental coverage on your existing auto policy, then you are entitled to a rental car. If your accident falls under the personal property category then you are entitled to a car rental paid for by the insurance company. I need a rental vehicle but I don’t have rental insurance coverage? Scott’s Body Shop offers our customers a discounted rate on auto rentals through enterprise. We also have free loaners that are first come first serve based on availability. More details can be provided when you schedule your repairs. Do I need to schedule my own rental vehicle? You can schedule your vehicle rental or the team at Crossroads Collision can schedule it for you! However, some insurance companies may request that you schedule your rental vehicle. How do I pick up my rental vehicle? Just drop your car at Scott’s Body Shop during business hours, let us know you are expecting a rental vehicle, and the rental company will either bring the rental to you or come pick you up and take you to their facility. When/How do I return my rental vehicle when repairs are complete on my vehicle? Enterprise – It is best to contact enterprise to see if they would like the vehicle dropped off at Scott’s Body Shop or Enterprise. Please do not return your rental vehicle unless a Scott’s Body Shop representative has contacted you and told you that your repairs are complete. If you are at all unsure about this, please give us a call to confirm. A deductible is the portion of your collision repair paid by you, if the repair is paid for by an insurance company. Your insurance company will be able to tell you if a deductible is applicable and what the amount of your deductible is. Deductible amounts are established at the time you purchase your auto insurance policy. When and who do I pay my deductible to? Your deductible is paid to Scott’s Body Shop when repairs are complete and you pick up your vehicle. What if additional damage is found during the repair of my vehicle? If additional damage is found during the repairs to your vehicle, and they are determined to be accident related, then the insurance company will pay for them. Scott’s Body Shop will produce a supplemental invoice and submit it to the insurance company when this occurs. Can I get Mechanical Services done on my vehicle while it is in the body shop? Absolutely! We offer a full service mechanical shop as well as collision. Communicate to the estimator what you would like to have done while it is here and we will coordinate it. Scott’s Body Shop offers a Nationwide Life-Time warranty for as long as you own the vehicle. Please ask for information on our Lifetime Warranty prior to scheduling your repairs. After I pick up my vehicle, do I need to take any precautions with the new paint finish? Our paint booth bakes the paint finish. Once the vehicle is assembled, we wash the vehicle and vacuum the interior. It is fine to wash the vehicle but do not use commercial car washes with brushes. We recommend that you do not wax the vehicle for approximately 3 months. This allows the paint to set up completely. What if I notice something that is not right, after picking up my vehicle? You may bring your vehicle back in, or give us a call to discuss anything you notice that may seem abnormal and related to the accident or recent repairs. Our goal is to restore your car to pre-accident condition. My vehicle is “totaled”. What does that mean? The cost to repair your vehicle is actually more than its value as determined by the insurance company. For example, if your vehicle costs $1000 to repair and its value is $500, then the insurer will only pay you the value of $500 plus applicable Connecticut sales tax and the insurer will keep the vehicle. Please see Question 10) below for how much you would receive if you decide you want to keep the car in situations where the cost to repair the vehicle is more than its value. I don’t care if my vehicle is totaled—can I still have it repaired and keep it? Yes, but you need to be aware of a couple of things. First, the insurance company will only pay you the value of your car. The following example assumes you are keeping the vehicle—the value is determined as follows: value at the time of loss using at least the average of the retail values according to the NADA Used Car Guide and one other automobile industry source approved by the Insurance Commissioner, less the “salvage value” determined by the insurance company. The insurer must tell you where they will be able to take the vehicle to be paid the “salvage value”. You will have to pay for all necessary repair work out-of-pocket if you choose to keep the vehicle. Also, the title to the vehicle has to be stamped “salvage” and the Department of Motor Vehicles will have to re-inspect the car before it is allowed back on the road. You should contact the Department of Motor Vehicles for further information regarding title re-issuance for “salvaged” vehicles.